This is a handy sweet treat to have in the freezer. It's great when friends are coming over, as you can make it in advance and just take it out when you're ready to eat it. Grease a 30cm x 20cm baking tray with oil and double line with cling film. Set aside. Mix together the yogurt and the orange zest and juice in a small bowl, then pour into the prepared tray. Put the cocoa, hazelnut butter and coconut oil in a small pan set over a low heat. Gently heat for 1 to 2 minutes, until it has softened. Put spoonfuls of the nut butter evenly over the yogurt and swirl through using the back of a spoon to create a marbled effect. 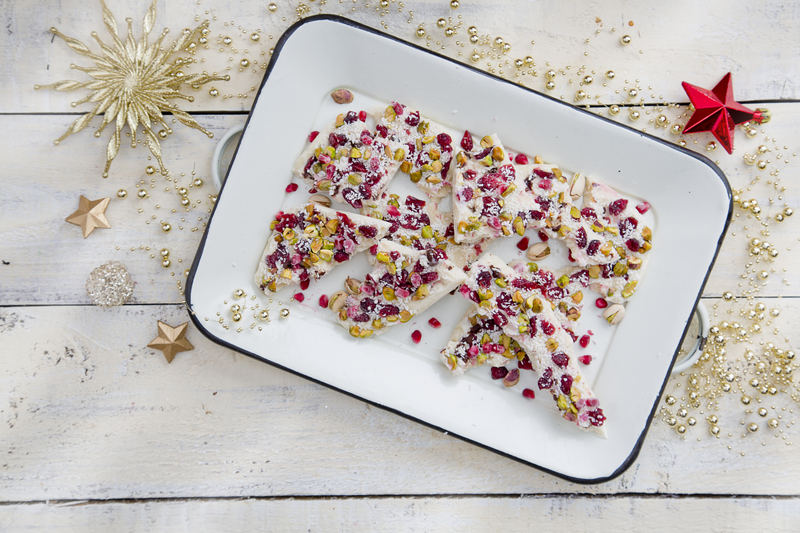 Evenly sprinkle over the pistachios, cranberries, pomegranate seeds and desiccated coconut. Press gently into the yogurt, but only slightly so they are still visible. Put in the freezer to harden for at least 2 hours or until you are ready to serve. To serve, break into pieces and serve on a platter or cake stand. Eat straight away or return to the freezer. Tip: The pistachios can be replaced with any other nut, like pecans or hazelnuts, and the cranberries can be replaced with another dried fruit. If you would like to make this free from refined sugar, you can use natural yogurt instead of the vanilla yogurt. If you're short on freezer space, make it in the tray, then once it has frozen, break it up and put the pieces in a ziplock bag between sheets of parchment paper, then return to the freezer.